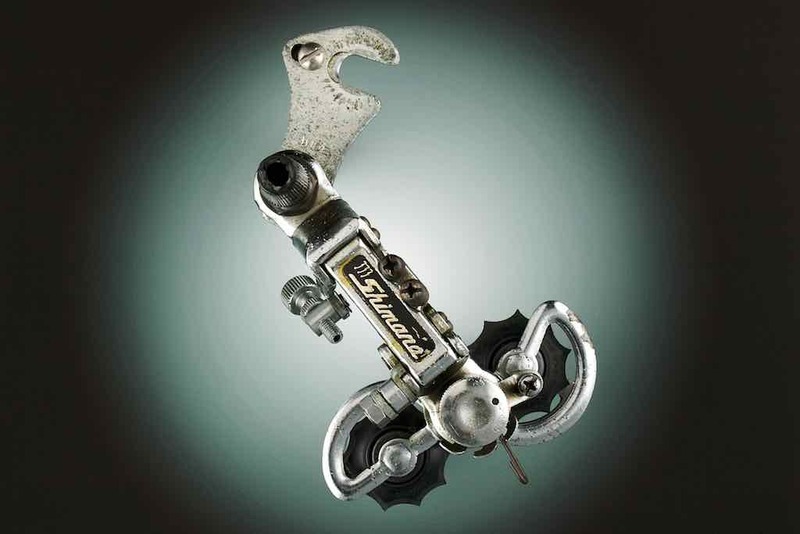 Hiroshi Nakamura claims the 3.3.3. was the first Shimano parallelogram model, introduced in 1965. Personally, I think this honour belongs to the Shimano Combi 12, but my evidence is all hearsay. The Shimano 3.3.3. used Shimano’s first parallelogram design. Frank Berto refers to it as an ‘inexpensive copy of the Campagnolo Gran Sport’. Certainly it has only one sprung pivot and the pulley cage pivots exactly on the axis through the centre of the pulley wheels. However the construction reminds me more of the 1961 Campagnolo Sportman. Thousands of miles of chain wear have fashioned the pulley wheels on this example into deadly, razor sharp, ninja shuriken throwing weapons.